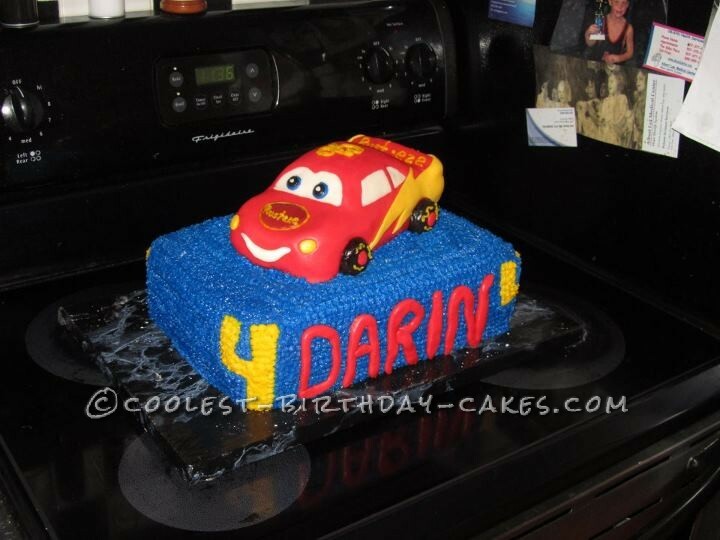 This Disney Cars birthday cake took me 4 to 5 hours to make, the base consist of two half sheet cakes stacked, then to make the car I baked one 9×13 cut in half and stacked it. Than I carved it out into the shape I wanted. I hand piped the whole base….which takes for ever but looks nice when done. For Lightning I used homemade butter cream fondant. This cake was a lot of work but seeing the end result made it all worth while and the little boy loved it!! The tips I have when carving the car is make as few cuts as possible and always carve the cake frozen. I used my own homemade butter cream frosting as well. It’s one cup butter to 3 cups powdered sugar, 2 to 3 Tbsp of milk and and 2 tsp vanilla. The Wilton food color gel works the best for me and remember when working with red, give it a little time because it does darken with time.